Because even the gods need some time off, you know? And if you're a god from the frozen tundra, it only makes sense you'd take your vacation in the tropics. Also, I like to think there are several small children cowering in terror just off-camera where Volstagg will land his belly buster. A bit comic, but it’s good. Unfortunately, when I got into mythology, I only delved into Greek. So I’m at loss with Egyptian, and in this case, Norse. I only know Odin and Thor out of Norse, so I’m afraid I can’t really make much of a comment on the personality of “Volstagg” and if he would be on a Summer Vacation. I’m pretty sure there’s no Volstagg in Norse mythology, Connor. He’s purely Marvel comics, I think. Godchecker doesn’t list him or the other guys in the Warriors Three, anyway. He needs to have Lipo before he lands. Either that, or there’s gonna be a pancake with his head on it within 5 seconds. *sighs* This reminds me of the rumor that BRIAN BLESSED was going to play Odin in the Thor movie… sadly apparently untrue. Although I thought he’d make a much better Volstagg. Fyzza, don’t worry, all the Norse gods in the Marvel Universe have increased Density, so Volstagg should be fine! @Connor S.: Volstagg is a Marvel character based on the Norse beliefs and culture. As with the realms of ancient Greeks and Egyptians, there are dozens if not hundreds of unnamed gods and “god-like” beings in Asgard. Not a stretch to add such a warrior in a comic book or movie. As for me, I’m a snob when it comes to pop culture treatment of mythology. Having these filler characters only invites an unsuspecting, mass-consumption public to become oblivious to and ignorant of history. Case in point: The comic book Astérix and Obélix. Based on the heroic Gaul Vercingétorix. Which ultimately led to the movie with… Gérard Depardieu! *puke* (I was a French major in college… that man is the bane of my existence). Though enjoyable cartoons with witty social commentary and satire, if you didn’t know the historic Vercingétorix, you’d think Astérix was a Disney creation. There was no historic “Obélix”. Don’t get me started on Mel Gibson and Braveheart. Or any of the recent Robin Hoods. 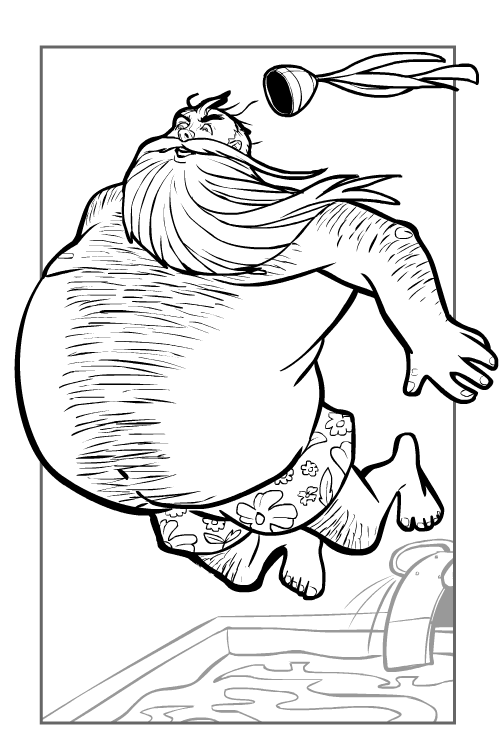 As for the pictures of Volstagg, Jeff, you should consider pitching a new Thor animated series. They have Super-Hero Squadron, so why not a light-hearted goofball Asgard? Glad you didn’t put him in a speedo that would have just…wrong. On so many levels. Redvector, I actually considered that, but then I thought it probably wouldn’t even be visible under the huuuuuge belly and then it would be REALLY disturbing. X-stacy and Atomic, that just shows you how little I know of Norse Mythology. @Connor S: If you enjoy Greek and Egyptian, you’ll definitely like Norse. It’s more “contemporary” and relatable to alot of people. The Scandanavians, Teutons, Frisians, and the various peoples of the British Isles practiced this late pagan religion. They were some of the last to bear witness of Europe’s conversion to Christianity.